The gluttonous hero is a fairly common trope in shonen manga. From the classic example of Goku, to the more modern Luffy, it’s always played for laughs how much the hero can eat. But never before has it been taken to such lengths. Mitsutoshi Shimabukuro, along with having one of the longest names of any manga artist, has taken the old trope and based an entire manga around it. The hero eating a metric ton of food is no longer a gag, but instead is the entire point of the manga. It is the gourmet age, and all over the world people are eating more and better. The creatures they feast on are fantastic mutants and monsters that take at least ten seasoned hunters armed with shotguns to take down the weakest of them. In such a world have arisen Gourmet Hunters, whose entire existence is centered around finding the biggest and baddest creatures, and then eating them. I have to admit, the thing that pulled me into reading this series was the absolute absurdity. Here was a concept that was pretty silly in itself, and it was being played straight. There are plenty of jokes, but no more or less than any shonen has. There’s even one fourth wall breaking joke in the first chapter. I had to see this series, even if it turned into an epic mess. As I put off reading it (I need to know if my investment will be worth it before I lay down the money), I kept hearing more and more about the series, pretty much all of it good. So I grew all the more excited, until I finally just sat down and read the entire four available volumes in a day. And I absolutely loved it, otherwise I would have taken much longer to read it. A lot of the characters feel familiar, but it’s the comfortable kind of familiar, like I’ve picked up the sequel to a favorite story. That’s part of what I feel the appeal of shonen is, it’s all good and fine to praise originality, but in the end there’s something to be said for a series that feel very similar to another manga. It’s like having an endless supply of sequels, most of which are enjoyable and just different enough to keep things interesting. Toriko even manages to adopt his own version of the non-killing pact shonen heroes make, despite the fact that his main goal requires him to kill. There’s something to be said about a series that not only praises something we can all get behind, namely good food, but also has a good moral to teach. While Toriko eats like none other, he makes his predecessors look like they’re on a hunger strike, it’s very clear that he does not waste food. He eats that much because that’s how much he can or has to eat, but over the entire course of the volume I can get a clear sense that Shimabukuro is preaching an anti-waste doctrine. And who can argue with that? What makes this manga really stand out for me are the details. Shimabukuro goes into a surprising amount of detail in creating his world. It’s similar to our own in many aspects, but everything is centered around food, often in surprising ways. For example, and this didn’t quite come across so well in the translation, the IGO soldiers common greeting is Gochousama-desita, which is what one says after finishing a meal. This is similar to Toriko starting each fight by saying, Itadakimasu (roughly, “let’s eat”) and ending it with Gochousama-desita. What I really like about this is that it’s a great world building quirk that shows exactly how food centric the world is. Even speech patterns are being affected. As an editing minor, a minor that requires quite a few linguistics classes, I enjoyed this part particularly, especially after just finishing up a class about usage and how languages change over time. In a theoretical world, where food and fine dinning is everything, it is perfectly believable that language would change to reference food more often. Though I do have one gripe. If Toriko has a candy house, how does he still have a house? He’s eaten to the point of becoming a balloon, so how is his house still standing!? 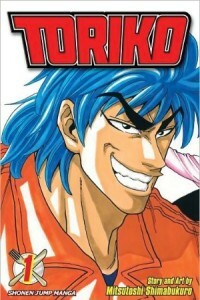 Toriko is that rare blend of original and familiar that works so well. I can definitely see this one becoming one of the greats (and if Shonen Jump covers are to be believed, it’s already happening).